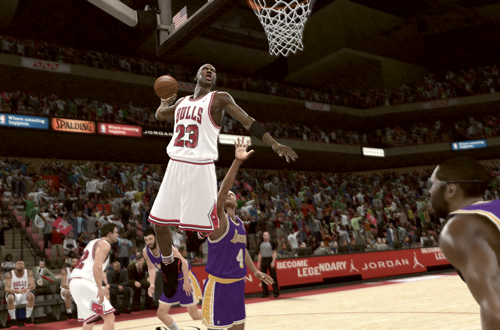 I’d tried this challenge before I switched to NBA 2K12, and it didn’t go so well. 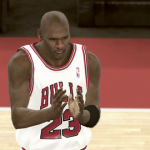 That attempt got off to a hot start, as I managed to knock down six early threes with MJ, and he finished the half with 35 points (possibly a couple more for good measure). Unfortunately, I wasn’t doing a stellar job of defending the Trail Blazers, and after a competitive third quarter, I completely fell apart in the fourth. Clyde Drexler was creeping up on the 20 points I needed to hold him under, but it didn’t matter; the game was well and truly lost by that point. I quit, and resolved to try again another time. 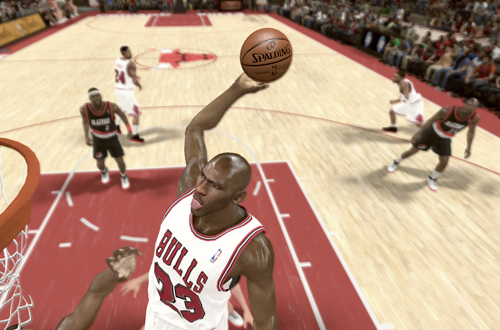 Before I began this attempt, I spent a little time in Practice with ’92 Michael Jordan. 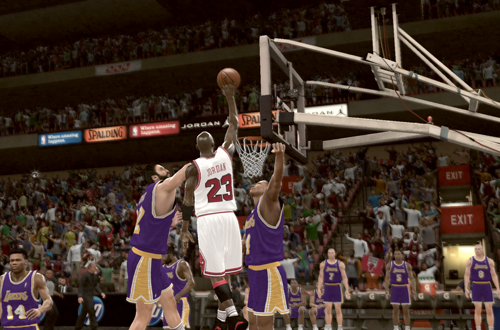 After getting reacquainted with some of NBA 2K11’s more advanced moves, and MJ’s shooting form, I dived in again. I adopted a similar strategy, immediately trying to knock down as many three-pointers as possible. Unfortunately, MJ picked up a couple of quick fouls and was sent to the bench, so I switched to manual substitutions and brought him back in. It took twenty attempts from beyond the arc, but he finished with eight treys. It was a close call, but I also managed to get the requisite 35 first half points. With those marks achieved, I was able to play a more team-oriented game in the third quarter, and blew the game open as a result. I maintained a comfortable double-digit lead throughout the second half, contrary to my previous attempt at the challenge. Drexler scored a couple of buckets late in the fourth to get into double digits, but I slowed the pace and ran down the clock, while daring Terry Porter to shoot instead, which took the ball out of The Glide’s hands. The approach proved effective, and I finished with a convincing victory, all goals reached, and The Shrug completed. It also taught me an important lesson: always use manual subs in the Jordan Challenge. 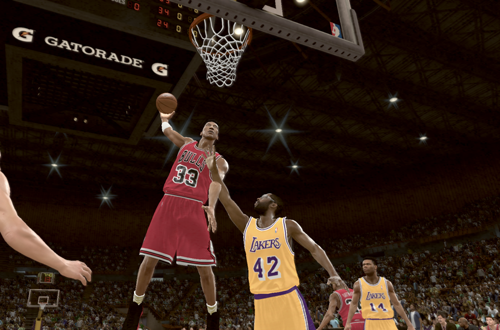 Gamers received a glimpse of this part of the Jordan Challenge upon booting up NBA 2K11 for the first time. I didn’t do so well at it all those years ago; as I mentioned, I was still getting used to the controls of the NBA 2K series back then. Therefore, I decided to reset the challenge and attempt it next. This is a long challenge, as it comprises the entire 1991 NBA Finals, rather than just a single game. On one hand, that makes it a little easier than some of the other challenges, since the goal is to match or exceed Michael Jordan’s numbers from the 1991 Finals, and you have multiple games to achieve that. On the other hand, MJ was incredible in those ’91 Finals, so you have to average 31+ points and 11+ assists per game, shoot 55% or better from the field, and win the series. If there’s one thing that the Jordan Challenge does, it reminds you that MJ was an amazing player. Game 1 doesn’t turn out to be too much of a challenge. I race out to an early lead, which I maintain all the way to an 88-71 victory. I decide that I’ll try to mix it up as far as scoring points and getting assists, so that I’m not frantically trying to pad numbers come the fourth quarter. I perhaps focus a little more on getting the assists however, as I’m confident that I can easily put up points with MJ. The strategy pays off, as he has 19 points and nine assists at the half. A big third quarter helps me really add to those totals, and he finishes with 40 points on 18-for-23 shooting, with 18 assists. It’s a good start, to put it mildly. Game 2 doesn’t start as smoothly. I lose the opening tip, and the Lakers score the first four points of the game. I’m running the offense through Jordan, once again alternating between trying to get assists and buckets, but unfortunately neither is happening. LA races out in front, and by the second quarter, they have a double digit lead. I’m really struggling, shooting 35% from the floor through the first two quarters, and trailing 43-31 at halftime. MJ is just 3-for-10, and I’m getting very frustrated with my inability to knock down shots. The CPU is also being a little cheesy with its interceptions, as well as splashing shots despite my effort at the defensive end. I’m actually considering restarting the game, but I decide to be a good sport and persevere. The decision pays off, as Jordan catches fire in the third, sparking a run that gets us right back into the game. Craig Hodges also comes up big with a couple of threes, and as the quarter draws to a close we’ve taken the lead, although a turnover allows the Lakers to tie it up again as it ends. I give it my all in the fourth and manage to prevail 77-71. Jordan finished with 32 points on 13-for-26 shooting, eight assists, and seven rebounds. Hodges has 13, including four three-pointers. It was one of those games that demonstrated how patience and good execution will overcome deficits and win games. When I was desperately hoisting threes and playing out of control in the second quarter, the deficit grew. When I settled down and took things one play at a time, I chipped away at the lead more effectively, and ultimately took control of the game. It was also a contest that reflected something that was so often the case in real life: as long as Michael Jordan was in the game, the Bulls were in with a chance to win it, even facing a double digit deficit against a tough opponent. I began Game 3 determined not to fall into the same trap, but unfortunately, it felt like the CPU was even more determined to cheese and cheat. All of my open shots: clang, clang, clang; all of the Lakers’ contested shots: swish, swish, swish…or so it seemed, anyway. It also seemed as though every time I did manage to bother their shooters, I was whistled for a shooting foul. Needless to say, I was getting hammered on some drives at the other end, and not getting the calls. The CPU bailing itself out with the officiating is one of my biggest gripes with basketball games, and at this point, I was feeling very frustrated with NBA 2K11. I was determined not to let the game slip away for much more than a quarter however, so I began a solid run in the second that allowed me to catch up, and even build an eight point lead. Unfortunately, it wasn’t long before the CPU was up to the same dirty tricks, and I found myself trailing by one at the half. This pretty much set the tone for the rest of the game, as whenever I’d get on a run and start taking control, I’d suddenly lose my grip thanks to some questionable turn of events. Even as I took a six point lead late, a wide open miss and a cheesy steal cut the lead to 73-72, with around a minute left. Thankfully, I still had Michael Jordan. He scored on a drive to extend the lead to three, and then I forced a bad pass to get the ball back with around thirty seconds left. I ran down the clock, but was forced to put up a three with Pippen as the play broke down, and the shot clock began working against me. He made it, giving me a little breathing room. After an intentional foul, I managed to outrun the Lakers’ defenders with MJ, and score one final layup for an 80-72 victory. Jordan finished with 38 points, 11 assists, eight rebounds, and shot 16-for-25 from the field, remaining on track to finish the series with the required numbers. As Game 4 begins, I’m hoping to get out to a better start, and groan when Sam Perkins ends up scoring the first two points of the contest. However, MJ feeds Pippen for a three-pointer on the very next play. I’ve been struggling to score with Pip throughout the series, but this is his night to shine. I’m making highlight plays with him including a big dunk, as he scores 15 first half points. He ends up with 27 points on 8-for-11 shooting (including 3-for-4 from downtown), three rebounds, and three assists. The whole team is shooting the lights out as I make nine of my first eleven attempts, while the Lakers struggle. It’s a complete reversal of the last two games. I also manage to score 14 points with Horace Grant, marking the first time in the series I’ve had a good night with all three of the Bulls’ original trio. As expected – and intended, given the goal of the Jordan Challenge – Michael Jordan is once again the star of the night, as he was so many times in real life. With hot shooting in the first half, I’ve built a comfortable double digit lead, and locked up MJ’s average of 31 points and 11 assists by halftime. Unless I really mess up in the second half, I’m closing this one out in four games, hitting all the goals, and completing the challenge a lot more comfortably than the last two games suggested I would. A bit of cheese by the CPU prevents me from really blowing the game wide open, but the Lakers never come closer than fourteen points. 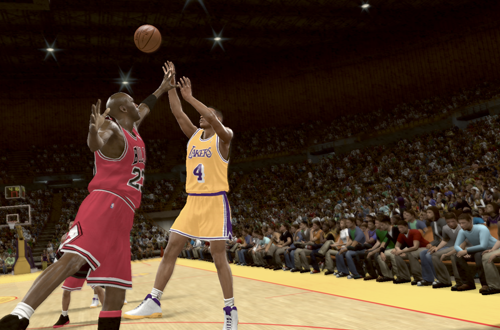 Mimicking real life, I dribble out the final seconds with Scottie Pippen, but there’s no special animation for it. MJ finishes with 31 points on 13-for-14 shooting, 12 assists, and nine rebounds, coming up just shy of a triple-double. It feels great to finish the challenge in style, especially after two very hard-fought (and somewhat frustrating) games. It’s in the books now though, so another pair of Air Jordan shoes is unlocked, and I’m now halfway through the Jordan Challenge; five down, five more to go. 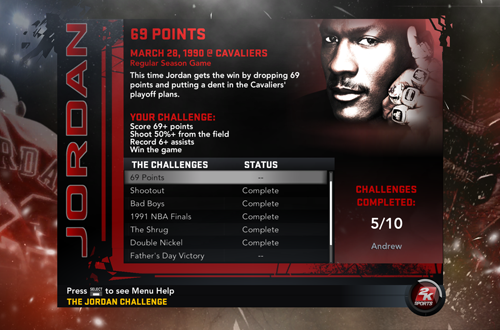 So far, going back and working on completing the Jordan Challenge has been a lot of fun. Frustrating at times, but definitely fun all the same. The five remaining games are The Arrival (MJ’s 63 point game against the Celtics), 69 Points (MJ’s career high against the Cleveland Cavaliers), Father’s Day Victory (Game 6 of the 1996 NBA Finals), The Flu Game (Game 5 of the 1997 NBA Finals), and Michael’s Last Dance (Game 6 of the 1998 NBA Finals). I’m looking forward to giving them a shot, so stay tuned for Part 2 of Finishing The Jordan Challenge! This is an extremely good read. This was the last 2K that I owned on console. The Classic stuff was so on point. You really felt like you were experiencing the Jordan era. Absolutely! What they did in NBA 2K11 and NBA 2K12 was fantastic, especially given the difficulty in getting likeness rights for certain players. As i said, I’m definitely enjoying going back and taking care of some unfinished business.